As most of you know recently I got a hair make over. It really has change my out look on life. I feel better about how I look and it reflects on how I act. I have always had frizzy curly/wavy hair and it drives me nuts! I won a flat iron and was able to sort of mimic the look the hair stylist gave me. But it just wasn't the same. It was still poofy and not as straight as she made it. I was so sad that I only looked like, as we call it in our house, the "hot" me for a few days until I washed my hair and I was back in frizz land! I was defeated by the fact that I could not get my hair as straight and smooth as I knew it had the potential to. After some research I realized I could not get the salon look because I did not have the salon tools. Although I had a nice gold plated flat iron it did not have the technology or heating capabilities of the professional tools. When I found the website Flat Iron Experts it was my moment when I knew I will be "hot" me again soon! I looked at all the flat irons available and there are so many great ones. I found the Avanti Wet-Dry Nano-Titanium Ceramic Silver Digital Flat Iron. It is perfect for me since as a mom there are times when I don't have time to blow dry my hair and other times when I cannot turn on a hair dryer or I will wake up my sleeping little boy. The first thing I liked about the Avanti Flat Iron was turning it on. You had to hold in the button for a few seconds until it lit up and make a little happy noise letting you know it was on and beginning to warm up. The digital read out lets you know exactly how warm the flat iron will be. The last one I had was a dial and I had only a guess of what temperature it was set at. It warmed up in 30 seconds! I was very impressed with the flat iron and I had not even used it yet! For me knowing I have thick course hair I knew I needed one that could give me the higher heating temperatures to get my hair flat. 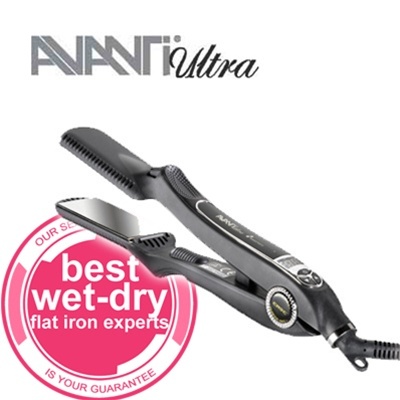 The Avanti flat iron can go as high as 450 degrees opposed to the other flat iron that could only heat to 350 degrees. I know that is a reason that the Avanti worked better because it could get enough heat to flatten my hair. Tears of joy is the only way to explain what happened next! I have no skill when it comes to doing my hair but just the first section of my hair I straightened I was so excited! It was flat, smooth and just like it looked in the salon. I got more excited as each section of my hair I straightened. After getting the under section of my hair straightened I moved onto the top section of my hair. I instantly knew I was on my way to looking like I did when I left the salon. I straightened the front part of my hair and began to feel emotional. It was actually flat and smooth. If you have suffered with frizzy poofy hair for as long as I have I am sure you can relate! When I was done with my hair I stood there and just stared at my hair for a few minutes. I was so impressed that it looked exactly as it did the day I first had it done. I called my husband into the bathroom and his first comment was "Wow"! He was shocked it looked perfect and did not take very much time. With the gold plated flat iron I used before it would take over a hour and still look frizzy. I started to cry knowing I did not have to constantly think there was no way I could have straight smooth hair like the salon gave me. It was causing me a lot of stress and now I know it was the tool I was using and not me! I definitely recommend the Avanti Wet-Dry Nano-Titanium Ceramic Silver Digital Flat Iron to any woman who struggles with frizz or other styling tools that can't get you the salon look you want. It is a great investment in your hair and hair happiness! If you would like more information on Flat Iron Experts and the products they carry you can follow them on Facebook. 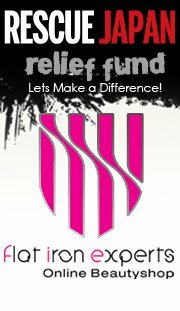 They are also having a Facebook promotion this month to donate $5 to the relief efforts in Japan for everyone that uploads a pic of themselves holding a sign that says Help Japan.